For quite some time when I first moved into the neighbourhood, I was unsure of what to call my 'hood. I wondered what it's catchy moniker was - Upper Beach? Upper Leslieville? I now know it's called Danforth Village, but I just recently discovered that in the early days of Toronto, the area between Greenwood and Woodbine was called "Upper Midway." Why Upper Midway? To find out, my dear readers, you'll have to sign up for this weekend's "Jane's Walk". 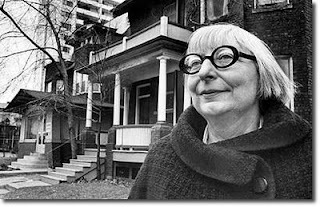 Jane Jacobs was one of North America's most important urbanists and is best known for stopping the "Spadina Expressway" back in the 60's. There are a bunch of walks sponsored by the Centre for City Ecology around Toronto, but the one that you should care about is called "The Other Danforth: Life and Death of Upper Midway." The tour guides are Joe Cooper, a columnist with the East York-Riverdale Mirror, and Stephen Wickens, amateur urbanist and consummate newspaper man. Scroll allllll the way down and select any one of the four 'Other Danforth' walks that you would like to attend. New Spinning Studio on Danforth - Free classes! Wonderful cache of East York info! Welcome to the East End Pioneer!